A few weeks ago, I received an order for sixty dumplings consisting of four different fillings. This was my first proper order so I wanted to ensure that my dumplings were absolutely perfect. Originally my tofu dumplings were not good enough so I asked my friend to help me with this and she came up with the idea of using Tempah. Tempah is basically fermented soybeans and has a lovely crunchy texture to it. The filling was mixed in with kale, shiitake mushrooms, ginger and shallots and wow it was certainly super tasty! 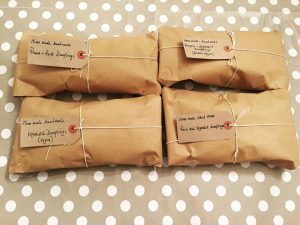 I produced hand written labels and carefully wrapped each batch and then off it went to a my lovely customer. It’s so rewarding to actually hand deliver my dumplings knowing that each dumpling was handmade with lots of love.